issue where major differences remain is regulating derivatives. Today on the Senate floor, Shelby pretty much eviscerated the measure, while a red-faced and anxious-looking Chris Dodd sat across the aisle from the Alabama senator. 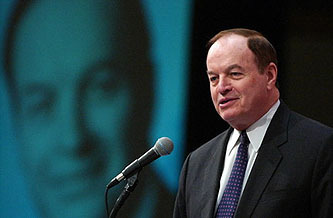 “This bill threatens our economy,” Shelby said. He added that the bill would leave taxpayers on the hook for future bailouts; the derivatives provisions would impair the economy; a new consumer bureau would stifle consumer lending; and a proposed Office of Financial Research, which would gather financial data used to predict future financial crises, would pry into Americans’ lives and violate their civil liberties. Hopefully this is just showboating, because if it’s not it means that Republicans still aren’t in a mood to get serious about financial reform. They just want to gut the entire measure. Either way, it’s pretty reckless behavior.